In the following article we are focusing our product review on Piping Rock Vein Care Formula. The manufacturer claims that this product can provide relief from varicose and spider veins, relief from leg pain, and improved circulation. Horse Chestnut is known for reducing the symptoms of poor blood circulation, pain, tiredness, swelling in the legs, itching, varicose veins and water retention. Since it contains gelatin, it is unsuitable for vegans and vegetarians. Take 2 capsules daily with a meal. The manufacturer did not specify a preferred time of day for taking the capsules, or if you can split the dose into two separate doses. Not intended for use by pregnant or nursing women. If you are taking any medications, planning any medical or surgical procedure or have any medical condition, consult your doctor before use. Avoid this product if you have liver or kidney disease. If any adverse reactions occur, immediately stop using this product and consult your doctor. Not intended for use by persons under the age of 18. The product is available from the manufacturer’s website where a 60 capsule bottle (one month supply) costs just $7.43. There are no bulk buying discounts or new customer incentives. Shipping is extra and we were not able to find out how much international shipping from the Philippines where the product is made to the U.S. If not completely satisfied, you can return the unused portion (within one year of date of purchase) with a short explanation, to receive a prompt refund. You are responsible for the shipping costs to send the product to the warehouse in New York. The manufacturer does not refund the return shipping cost. 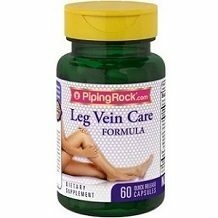 In conclusion of our review of Piping Rock Leg Vein Care Formula, we were encouraged by several aspects about this product. 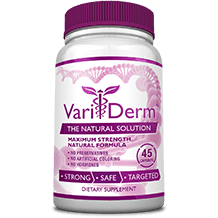 There are some beneficial ingredients in the product that can potentially help alleviate varicose leg symptoms. The product is very inexpensive at only $7.43 for a month; supply of capsules. There is a one year guarantee provided by the manufacturer. The product was let down is several key areas however. There are no bulk buying discounts or new customer incentives. Shipping is extra and we were not able to find out how much international shipping from the Philippines where the product is made to the U.S. Since it contains gelatin, the product is unsuitable for vegans and vegetarians. There is no assurance from the manufacturer that the product is made in an FDA certified facility, that it is free from binders and fillers, and that the ingredients are non GMO. In terms of dosage, the instructions were somewhat vague. It did not specify if the 2 capsules can be taken as one dose or split throughout the day. We also do not know the best time of day to take the capsules to achieve the best results and avoid side effects. There were a lot of warnings on use of the capsules that is concerning to us. The money-back guarantee does not cover return shipping and you would be responsible for that. We did not find customer reviews for this product. For all these reasons we suggest that you look for an alternative brand of varicose vein treatment.